The Red Line detention report was launched at an event hosted at Quaker House in Brussels on 6 February 2018, which included presentations by each country partner in addition to presentations by Elina Steinerte, vice-chair of the UN Working Group on Arbitrary Detention; Judith Sargentini, member of the European Parliament; the GDP’s Michael Flynn; ECRE’s Minos Mouzourakis; and HHC’s Gruša Matevžič. The use of detention upon entry increased in 2015 with the increase in the number of migrant arrivals, but it has continued to this date despite a significant decrease in asylum applications in Bulgaria, Hungary, and Italy. In 2017, 73.5% of asylum seekers were detained in Hungary (an increase from 2.9%) and 59% in Bulgaria, while the average length of detention has also increased in both countries. In 2017 the use of migrant detention increased in Italy by 25% and in Greece by 75%. The research revealed various practices of de facto detention, such as “protective custody” of children in Greece, hot spot detention in Greece and Italy, transit zone detention in Greece and Hungary, detention during pushback in Greece, detention on boats in Italy and detention in pre-removal centres in Greece. The common element in these forms of detention is that “de facto detention” occurs when individuals are deprived of their liberty in the absence of a detention order. Their confinement is not classified as detention under domestic law and their only possibility of release is by leaving to another country. The increased frequency with which asylum seekers are detained upon entry is motivated by a range of different practical, political, and legal considerations. 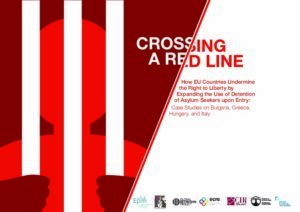 It has been used as a general response to cope with unprecedented pressure on the reception and asylum processing systems in all of the countries studied (including as a response to the lack of open reception accommodation facilities in Bulgaria and Greece). Detention has also been promoted as a security measure (e.g. against terrorism) and used as a means to prevent asylum seekers from crossing external borders in a bid to gain political support for the ruling government (in Bulgaria, Hungary, and Italy). No clear evidence confirms that detention reduces the flow of arrivals as a response to an increased migratory pressure.